Home » Skin care » Geranium Oil-Good for Your Skin, Good for Your Hair! When it comes to nature, one thing we’re sure of is the impressive number of ingredients it provides that ate great remedies for various health issues. Able to improve the mental, physical and emotional health, geranium oil has been used even by the ancient Egyptian for getting a glowing skin. not only this oil is going to address acne or reduce inflammation, but it’s also going to balance hormone and minimize anxiety. The sweet-smelling oil makes you feel better and energized, altogether. When to use geranium oil? Is geranium oil different from the rose geranium oil? Is geranium oil good for hair? Extracted from the leaves, stems and flowers of the geranium plant, the geranium oil is typically non-irritant, non-toxic and non-sensitizing. It heals the wound and alleviates depression, standing out as a reliable antidepressant. Addressing successfully eczema and dermatitis, geranium oil is one popular and dependable oil for so many skin issues. When used in aromatherapy applications, geranium essential oil is going to reduce feelings of fatigue, tension, anxiety, sadness, and stress. It’s also able to increase concentration and cognitive function, but also to balance both emotions and hormones. As for the cosmetic purposes, geranium oil may be applied topically for removing dead cells and tightening the skin, reducing the visibility of signs of aging and boosting the regeneration of skin. Let’s not forget that geranium oil has medicinal benefits as it works as an anti-septic and anti-inflammatory agent. It alleviates symptoms of menstruation and menopause, improving circulation and reducing the pain and blood pressure, sustaining your immunity. This is quite a common question as they’re both really good for your health. Both rose geranium and geranium oil come for the Pelargonium graveolens plant, but they’re made from various plants. The geranium oil is also known as Pelargonium graveolens, whereas the rose geranium’s botanical name is Pelargonium graveolens var. Roseum. Nevertheless, the two oils are very similar when it comes to benefits and active components. At the end of the day, it’s simply a matter of personal taste as the two have different scents. 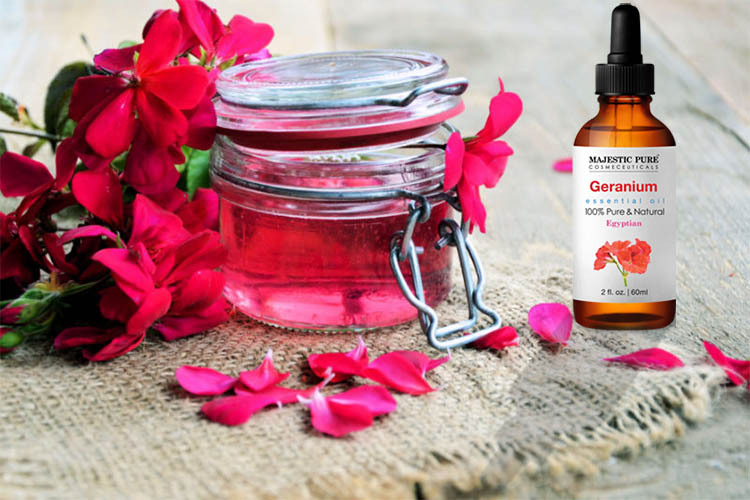 Geranium oil is a great addition to your skin care regimen as it manages to address so many problems related to skin. All of the dirt and pollution makes your skin look dull and tired so cleansing the skin is essential for a better and radiantly looking skin. you don’t have to use the commercial products for replenishing or rejuvenating the skin, and you should go natural, cleansing your skin with geranium oil. Due to its properties, you can use geranium oil directly on the skin for cleaning. You may also add it to water when bathing. No matter the way, geranium oil is going to leave your skin cleansed and glowing. This is one fundamental problem that we’re all going to face sooner or later in our life. You can pay the high dollar and take the leap of faith with the high end cosmetic solutions, or you can have your shot with the geranium oil. 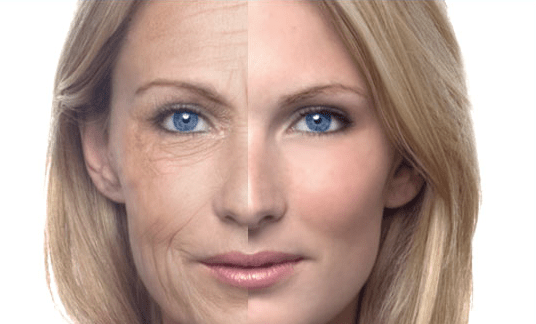 The oil is going to improve the contractions of the muscles and tissues, reducing the sagging of an aging skin. it tightens the skin and reduces the appearance of wrinkles and fine lines. Even if you can’t see it, the astringent properties of the geranium oil are great for your skin. this helps geranium oil improve the muscle contractions, which translates into firmer and more toned skin. isn’t this the way a younger looking skin supposed to be? Geranium oil tones the skin as it helps all the functions and systems of your body work just right. It controls the endocrine glands that regulate various acids, enzymes and hormones of the body. It improves the performances of circulatory, enzymes, respiratory, nervous and excretory systems. It evens out the skin tone and tones the skin, improving the skin complexion and reducing acne. Geranium oil is known for its ability to address various skin conditions such as rashes, eczema, acne, fungal infections and dermatitis. It’s a great cicatrisant and it smooths out the scars, leaving your skin better and younger looking. Geranium oil improves the blood circulation below the skin surface, helping with the even distribution of melanin. This translates into fairer and evener looking skin. Presenting antiseptic, anti-inflammatory and antibacterial abilities, geranium oil is effective for treating cuts, injuries and wounds. It doesn’t just heal scratches and scrapes, but it’s also helping the skin look more beautiful. When it comes to acne, geranium is quite the winning lottery ticket. Even if there are many factors that cause acne, bacteria is the main cause of it to begin with. The bacteria are found naturally in our pores, causing pimples, whiteheads and blackheads when combined with the sebum within the skin. Due to its antibacterial and antiseptic abilities, geranium oil may prevent bacteria get into the pores and lead to breakouts when applied topically. In addition, geranium oil is going to prevent breakouts as it controls the production of sebum in skin. even if it’s not quite clear how it works, geranium oil does manage to “trick” the skin that it produces enough sebum. Therefore, it regulates the sebum production in skin. Imbalanced hormones may also cause acne and geranium oil regulates them too, especially estrogen, insulin and progesterone. Geranium oil has a pleasant and toning aroma. Its scent ling is going to stay on skin for quite some time and its bacterial ability helps with removing the body odor. You may want to use geranium oil for its deodorant properties. You can combine it with some coconut oil for making a chemical-free and natural body lotion. You only need to add few drops into your bathwater for benefiting the geranium oil too. You may use geranium oil for treating breakouts. place a few drops of geranium oil onto a cotton ball or a q-tip, using it as a spot treatment directly on the cleansed area of your skin. 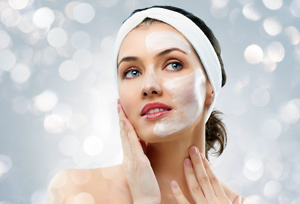 If you’re determined the reduce the risk for breakouts, you should add a couple of geranium oil to your moisturizer. Applying it right onto the affected spots is going to work as well. The astringent abilities of geranium oil explain why this oil tightens the skin, making the wrinkles more difficult to notice. As it’s loaded with fatty acids, the geranium oil also builds the healthy skin cells, which means healthier and younger looking skin later on. Adding a couple of drops of geranium essential oil to your moisturizer is going to mean the world for your skin, when applied every single day. You can step up your game and make yourself a glowing skin face mask that doesn’t just eliminates impurities, but also unclogs the pores and gives your skin a fresh and silky smooth feel too. You should apply the mask on clean and dry skin, right after exfoliating it. You’re going to notice a better looking skin when using the mask every now and then. RELATED POST: Forever Young- Why Does Pharrell Williams Look Like That? Mix the bentonite clay with some water in a small bowl. You want to get a paste so add water until you get the right consistency. Add the geranium essential oil and apply the mask right to your skin. Let the mask work for 10-15 minutes and rinse it when time is up. Geranium oil isn’t good just for your skin, but it also works for your hair. Geranium oil is able to fight free radicals as it presents a high concentration of flavonoid and antioxidants. It maintains the hair healthy and strong so it’s quite a common ingredient for the hair treatment products. in addition, it eliminates impurities and product buildup from the scalp and hair, helping the color to get into the hair strands, while protecting it at the same time. Due to its antibacterial and antiseptic properties, the geranium oil is going to block the growth of bacteria. This is why it manages to solve various skin conditions such as inflammation, allergies, burns or irritations. It you’re the hypersensitive type, using a protective serum formulated with geranium oil or combining it with your hair color mixture is going to reduce the risk for irritation or any side reaction later on. We all know that amino acids are fundamental for a healthy hair. they’re essential for producing keratin, which is the protein that maintains your hair and scalp healthy and well. When you don’t have enough keratin, the hair gets brittle and doesn’t grow anymore, resulting into hair loss. Loaded with amino acids, geranium oil is going to eliminate this risk, as it nourishes the hair with amino acids. 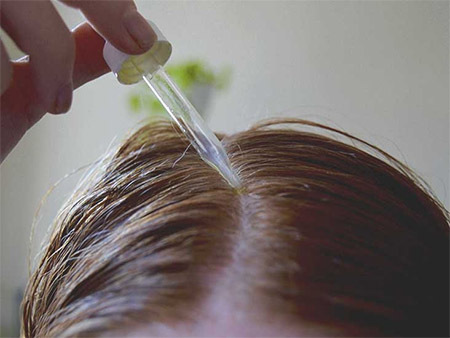 Use a combo of geranium oil and jojoba oil for applying to your hair. If your scalp isn’t well moisturized or if the sebaceous glands produce too much oil, the risk for dandruff is pretty high. Severe itching, irritation and flaking are soon to be expected. Luckily for us, geranium oil is going to work in both situation- under and over production, which is why it’s such a dependable ingredient for both oily and dry dandruff. Geranium oil balances the scalp’s pH as it controls the sebum production and cleanses the scalp on deeper level. Look for a shampoo formulated with geranium oil when dealing with both dry or oily dandruff. Geranium oil is a great ingredient to have for your shampoo or conditioner as it leaves a pleasant cherry floral scent in your hair. You may also simply spray it a bit over your hair, for an attractive scent on your hair strands. Even if the geranium oil has so many benefits for your hair and skin, you should keep in mind that any essential oil comes with some risks, especially if you have a sensitive skin. You should always be sure you’re not allergic to it and run a patch test on your wrist or foot. Wait for 24 hours and check carefully for any abnormalities. Even if it combines with several essential oils, it’s better to check to see the combo you’re going to use it’s safe for human use. Geranium oil combines great with carrot seed, lavender, orange, cedar wood, bergamot, neroli, basil, rosemary, jasmine and grapefruit oil. Double check the safety of your combo before applying it to your skin or hair, either way. PreviousPrevious post:Forever Young- Why Does Pharrell Williams Look Like That? Next Next post:Is Protein Good for Your Hair?